The School of Education will host an open house for potential students interested in graduate study on Friday, Nov. 4, from 4:30-6 p.m. in the Sharon Jacquet Education Commons, located in Huntington Hall on the corner or Marshall Street and University Avenue. Faculty, staff and current graduate students will be available at the open house to answer questions. Faculty, staff and current graduate students will offer information on the School of Education’s M.S., C.A.S. and doctoral programs in: counseling and human services; cultural foundations of education; exercise science; higher education; instructional design, development and evaluation; reading and language arts; and teaching and leadership. 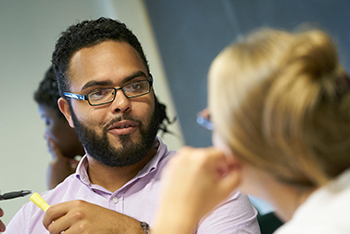 The School of Education offers graduate degrees that lead to careers in teaching, technology, health, research and leadership in diverse fields in the United States and globally. Online and flexible-format programs are available, and are designed for the busy professional or remote learner. Most master’s programs can be completed in one year. The open house format of the event allows for students to attend at any time between 4:30-6 p.m., and to interact with representatives from the programs they are most interested in. Refreshments will be served. For more information or to register, call Speranza Migliore, graduate admissions recruiter at 315.443.9319, or visit http://soe.syr.edu.